Mine: Maybe the weekest of the three, but still a lot of fun. The airport settting works well. The villan is a little weak. 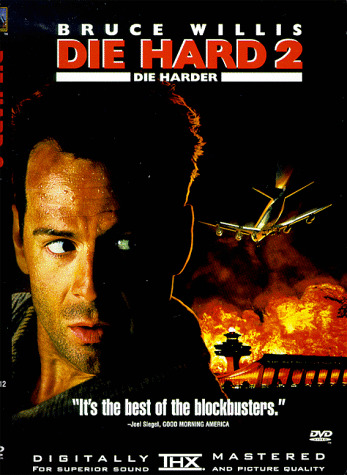 Leonard Maltin/Plot synopsis: Stupendously unbelievable--but very entertaining--sequel to the action hit; while waiting for his wife to land at Washington's Dulles Airport, Willis dives head-first into trouble when he gets wind of an impending terrorist-type plot. Lots of violent, large-scale action, and lots of fun--just don't look for lots of logic. Based on Walter Wager's novel 58 Minutes. Panavision.